← 11 tearing elements of Negative attitude! Determination is the key to implement any worthwhile project. Determination brings consistency in our efforts. It also motivates us to work hard for a task we have undertaken. Determination triggers perseverance which is an almost essential element in achieving significant success. But this indispensable quality of human being depend entirely on their attitude. It is the process of becoming resolute, of bringing firmness in your endeavour. Without determination one cannot hold conviction which is essential to convince people. Unless you are determined to follow your path, distractions may attract you attention. You lose focus. In such cases the efficacy of your efforts is bound to suffer. 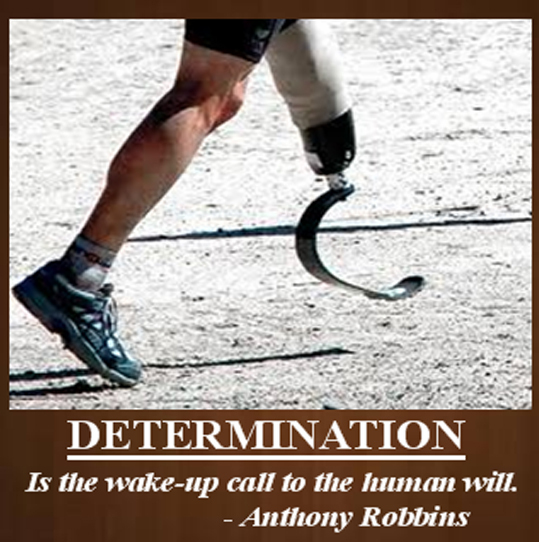 How is determination related to your attitude? Your attitude to life is extremely important in deciding your daily performance and how you want to lead your life. Your attitude will help you to set goals which need to be achieved. Each of your goals will require a separate plan of action. It you lack determination, due to your casual attitude, even written specific and SMART goals may become meaningless. Because your plans need to be implemented, these require perseverance which can come only when you are determined to do. The implementation will happen with determination to perform. Thus attitude and determinations are inter-related. In fact, these are intertwined. People who make significant progress are often called lucky. But they do not know how much hard work was put in to achieve that success. As Colin Powell said, “A dream does not become a reality through magic; it takes sweat, determination and hard work.” Any worthwhile goal or project is achieved with determination, dedication, self-discipline and lots of efforts. Further if your determination is fixed, your efforts are never wasted. Few things cannot be achieved if you have skill, and use diligence. Determination is also doing. It is not just a decision. It pushes you to do what you have decided to do. it makes you do things what need to be done at what time even if you don’t like it. It is said, “Wake up with determination, go to bed with satisfaction. Whenever you strongly desire to acquire something, you can’t stop thinking about it. Determination tells you that if you can’t stop thinking about it, don’t stop working for it. Road to success is under construction till it is completed. The same passes through many terrains; some are easy but others are difficult. Determination drives you ahead through difficult terrains which happen to be the strength of determination. Finally, determination enhances your self esteem. Self esteem in turn helps you to make you attitude positive impeccably. This entry was posted in Personality development and tagged Attitude, dedication, determination, Focus, Goals, how determination works, indispensable quality, road to success, Self Esteem, self-discipline. Bookmark the permalink.